Refrigerators complement a well-furnished house. They bring a modern touch regardless of the interior design you go for. However, when they become old and obsolete, it is a totally different story altogether. They make your house old, messy and unattractive. Getting rid of them is often the next move. But the main question is, who will pick up old refrigerators? The main challenge is often on how to get rid of old appliances on your own. Let us, South Bend Junk Removal Company, worry about that. We are located in Indiana and specialized in appliance disposal in South Bend, IN, and its surrounding. Generally, we take away anything considered hazardous like wood, construction materials, garden refuse, roofing items and furniture as well as recycling old appliance. 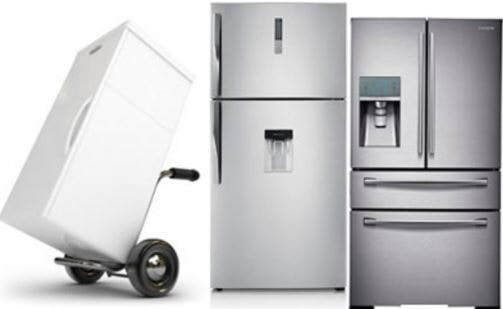 In particular, refrigerator recycling is among the common home recycle appliance that we handle. Take into account that of all appliances, refrigerator recycling in South Bend, Indiana is considered one of the most critical exercises. This is because they contain harmful chemicals that can damage the environment if badly handled. ​The old models especially those built before 1995, are regarded as more harmful than modern ones. They contain an earlier version of Freon referred to as R-12. This chemical is not only toxic but also depletes the ozone layer. Nonetheless, nowadays, the Freon, formerly known as Tetrafluoroethane, does not contain ozone-depleting substances. That is why modern fridges are more energy efficient. But whichever case, both of those versions have been revealed to contribute to climate change when emitted into the atmosphere. In recycling refrigerators, we ensure the harmful chemicals are disposed of properly and any other reusable materials like plastic, metal, and glass are professionally recycled. This also applies to any other haul away appliances. We have a team of specialized personnel which not only has experience in small appliance recycling in South Bend but also has all the required equipment needed to haul them away. The exercise usually takes the shortest time possible. Often it is advisable to be on site when our men arrive. But in case you running on a tight schedule, worry not. We will review the pricing and then call for your confirmation. Credit cards over the phone are also absolutely accepted. Convenience and customer satisfaction is usually our objective. But then again if you want to enjoy the most out of our service, you need to book for your appointment on time, as slots usually get filled quickly. You can either call or browse through our site to check out the available timetable. Once you have booked, you will provide your ZIP CODE for the pickup and that is just it. Generally, good quality servicing to our customers, improving our community, being open to diversion analysis and impact on our environment as well as energy consumption, is our top priority. But we cannot do it without you, our customers. We need to join hands and together we can definitely make a difference for this and generations to come by practicing responsible environmental practices today.